GOProud, the national organization representing gay and lesbian conservatives, announced that Ann Coulter will be headlining their first annual HomoCon event in New York City on Saturday, September 25th. HomoCon 2010 is billed as a party to celebrate gay and lesbian conservatives. Christopher Barron, Chairman of the Board for GoProud stated: The gay left has done their best to take all the fun out of politics, with their endless list of boycotts and protests. HomoCon is going to be our annual effort to counter the ‘no fun police’ on the left. I can’t think of any conservative more fun to headline our inaugural party then the self-professed ‘right-wing Judy Garland’ – Ann Coulter. 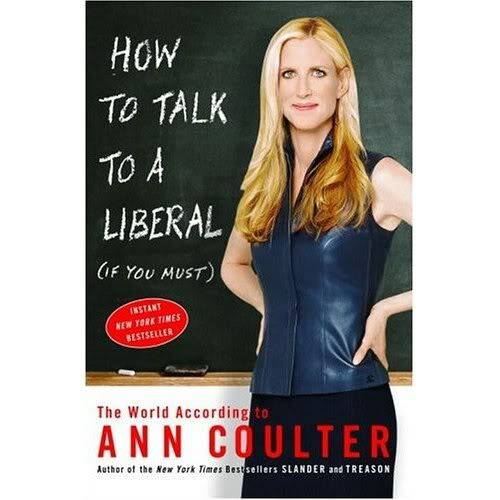 Ann Coulter, the author of several New York Times bestsellers, including Guilty Liberal Victims and Their Assault on America, is a controversial conservative writer and speaker who doesn’t mince her words nor her opinions. Choosing Coulter as their headliner for their first HomoCon event should garner more attention and more prestige for this fairly new conservative group. Along with the recent addition of Tammy Bruce to their organization, the Coulter coupe helps GOProud to position itself as a credible voice for the conservative gay and lesbian communities. Check out the GOProud website for additional information and ticket sales. This entry was posted in Media/Arts/Entertainment, Political/Social and tagged Ann Coulter, Christopher Barron, conservative, gay, GOProud, HomoCon, lesbian, Tammy Bruce. Bookmark the permalink.